Return to Home > Testosteron-Boosters/ tribulus>Levrone - LevroTest (AM+PM Formula) - 240caps. Levrone - LevroTest (AM+PM Formula) - 240caps. 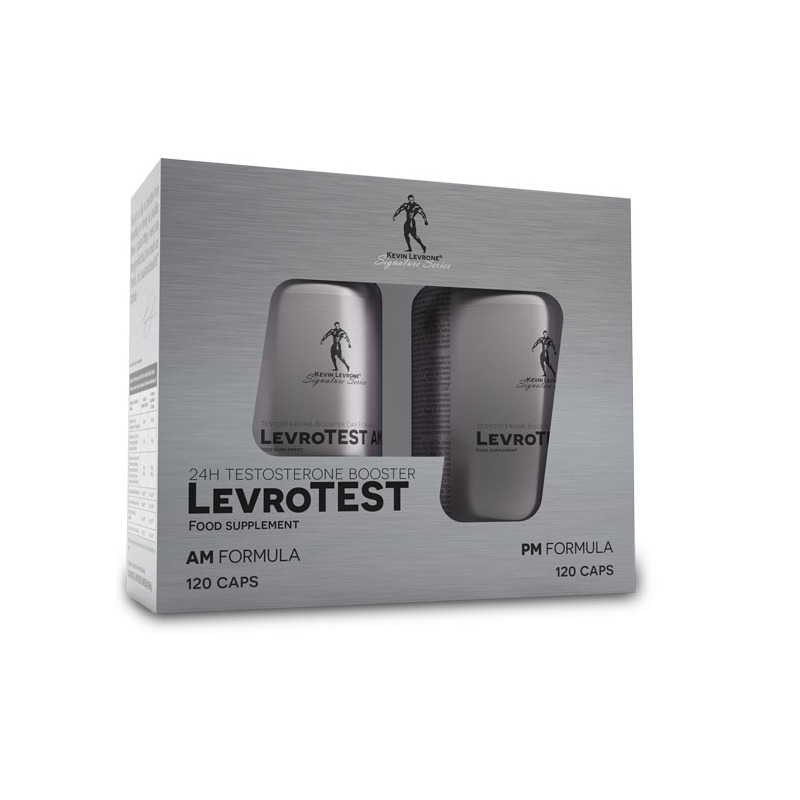 LevroTest is an innovative, biphasic testosterone booster which has positive effect on the increase of testosterone levels by stimulating the body both at day and night. 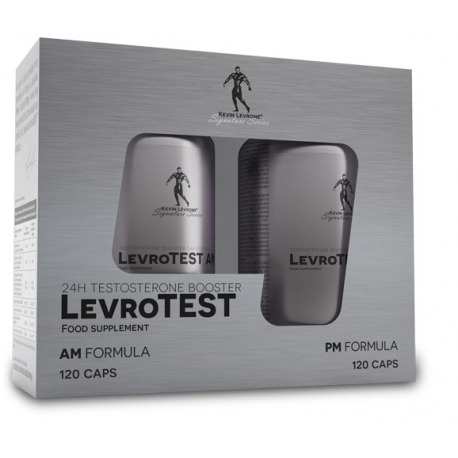 LevroTest Day Formula- Its formula consists of specially selected ingredients whose aim is to provide proper amount of energy during the greatest physical and intellectual activity and to activate the increased production of testosterone. According to research, D-aspartic acid contained in the preparation increases the production of luteinizing hormone, which in turn binds with receptors found on Leydig cells in the testes. This results in an increased synthesis of cyclic AMP (cAMP) and detachment of the side chain from the cholesterol molecule. The process is essential in the production of testosterone (steroidogenesis)5. In 2010, scientists from Naples conducted a study on a male group which was supplemented with D-aspartic acid. They noted 40% higher concentration of testosterone than in placebo group2. LevroTest Day Formula consists also of extract of Rhodiola rosea root which is an adaptogenic substance and facilitates adaptation of the body to exceptional situations, simultaneously reducing negative effects of stress. The action of Rhodiola rosea1 is additionally enhanced by resveratrol contained in an extract of Japanese knotweed. The formula consists also of Essential vitamins such as vitamin D and B vitamins. Vitamin D3, contributing to support the optimal functioning of muscles. LevroTest is also an advanced night formula prepared specially to activate night production of testosterone. It consists of i.a. famous extracts of fenugreek and Tribulus terrestris, which according to the studies can naturally stimulate the body to produce testosterone3. The combination of magnesium, vitamin B6 and zinc acts as ZMA which for years has been used by bodybuilders to improve the quality of sleep and the body’s regeneration parameters. Furthermore, magnesium supplementation helps to maintain the electrolyte balance and proper functioning of muscles. The biphasic LevroTest supplementation is the future of testosterone boosters. LevroTest will provide you with optimail support day and night – formulated by IFBB Hall of Famer Kevin Levrone. Darbinyan et al. Rhodiola roseain stress induced fatigue — A double blind cross-over study of a standardized extract SHR-5 with a repeated low-dose regimen on the mental performance of healthy physicians during night duty. Phytomedicine Volume 7, Issue 5, October 2000, Pages 365–371. Ingredients: D-Aspartic acid (DAA), capsule [gelatin, water, colours (E171, E122*, E124*, E133, E104*, E110*)], bulking agents (E460(ii), E341), Rhodiola root extract (3% rosavins, 1% salidrosides) (Rhodiola rosea L.), Polygonum root extract (50% resveratrol) (Polygonum cuspidatum Siebold & Zucc), anti-caking agents (E470b, E551), vitamin D (cholecalciferol), vitamin B6 (pyridoxine hydrochloride), vitamin B12 (cyanocobalamin), folate (pteroilomonoglutamic acid). *May have an adverse effect on activity and attention in children. Recommended Use: Take 4 capsules daily (2 in the morning, 1 during the day and 1 before training). Do not exceed the recommended daily dose. Warnings: Do not use if you are allergic to any of the supplement compounds. Food supplements should not be used as a substitute for a varied and balanced diet. A varied and balanced diet and a healthy lifestyle are recommended. Store in dry and cool place. Keep out of reach of young children. Protect from direct sunlight. Ingredients: Fenugreek extract (Trigonella foenum-graecum L., seed), tribulus extract (90% saponins) (Tribulus terrestris L., fruit), magnesium citrate, capsule [gelatin, water, colours (E171, E104*, E122*, E133, E110*)], bulking agents (E460(ii), E341), zinc sulphate, anti-caking agents (E470b, E551), vitamin B6 (pyridoxine hydrochloride). *May have an adverse effect on activity and attention in children. Recommended Use: Take 4 capsules daily before bedtime with glass of water. Do not exceed the recommended daily dose. Warnings: Do not use if you are allergic to any of the supplement compounds. Do not use if pregnant or nursing. Food supplements should not be used as a substitute for a varied diet. A varied and balanced diet and healthy lifestyle is recommended. Store in dry and cool place. Keep out of reach of young children. Protect from direct sunlight.